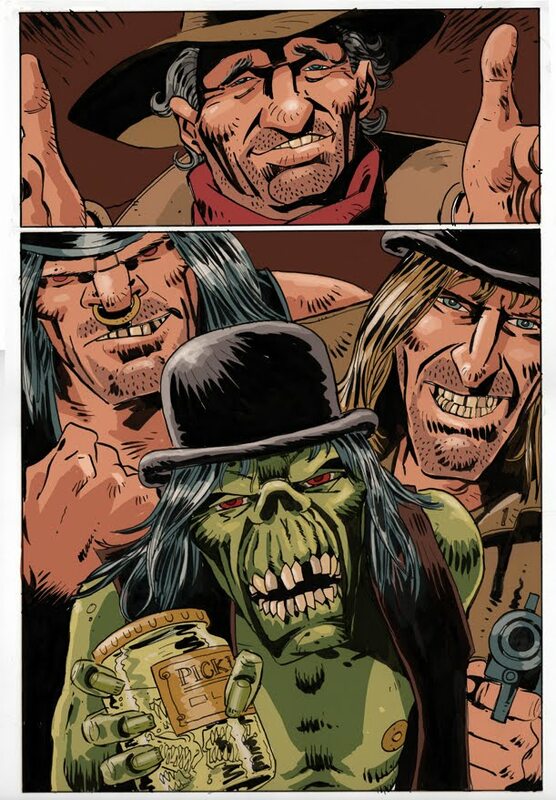 More old stuff I'm afraid, this is the Angel Gang from a Gordon Rennie story that featured in the Judge Dredd Lawman of the Future summer special (I think!). I guess this was from 1996. WJC recently did an Angel Gang image and I felt inspired to do one myself, unfortunately I haven't got the time and seeing as I had to draw them for the comic all those years ago I dug out some of the old pages. I've done a quick colouring job on them to spruce them up a bit. 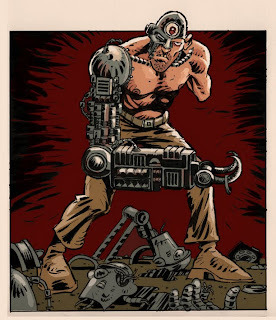 Quite shocking how Mick McMahon-esque these are. In fact, it was partly the feeling that I was walking McM's shadow that put me off wanting to do anymore Dredd for the next 15 years. And in those days anyone who was doing Dredd in anything other than the full acrylic body-builder sheen was probably frowned upon, especially someone doing a cod McM style. The cod McM style had it's day in the sun though in the end. Why didn't I think to blog about the World cup??? Because people who like comics don't like football and vice versa. Thankfully there are some exceptions (me included) otherwise this post would be a waste of time. 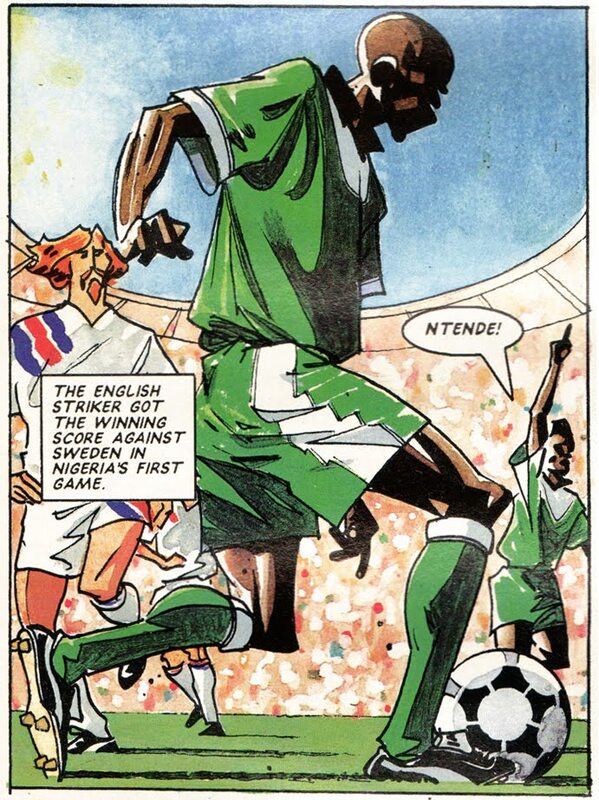 16 years ago I was still drawing Roy of the Rovers for the monthly and we embraced the world cup in the USA in our usual controversial style. 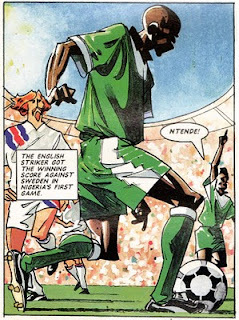 England didn't qualify for that world cup, but Roy of the Rovers was represented at the World Cup by 'Delroy of the Rovers', Paul Ntende, who opted to play for his father's home nation Nigeria over his country of birth. 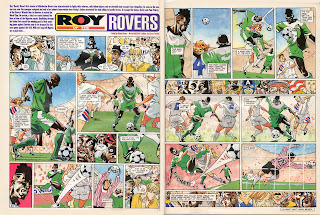 I don't know that I explained last time I blogged about Roy of The Rovers how the strips ran weekly in Shoot Magazine between each issue of the Monthly (this meant the only way to get the full story was to read both). This strip below is a two page strip from Shoot (9th July 1994). Hopefully Titan books will eventually collect all of these stories together. 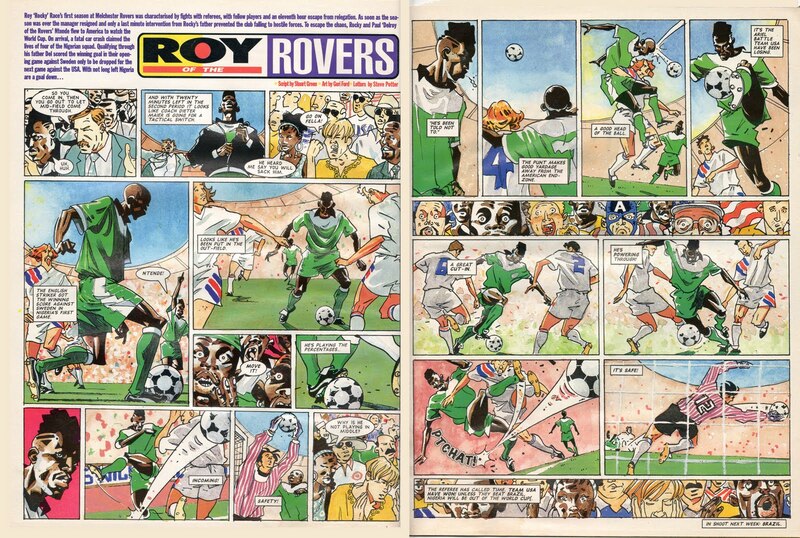 Digging through the drawers of old stuff I also unearthed this spread from Roy of the Rovers Monthly No17. 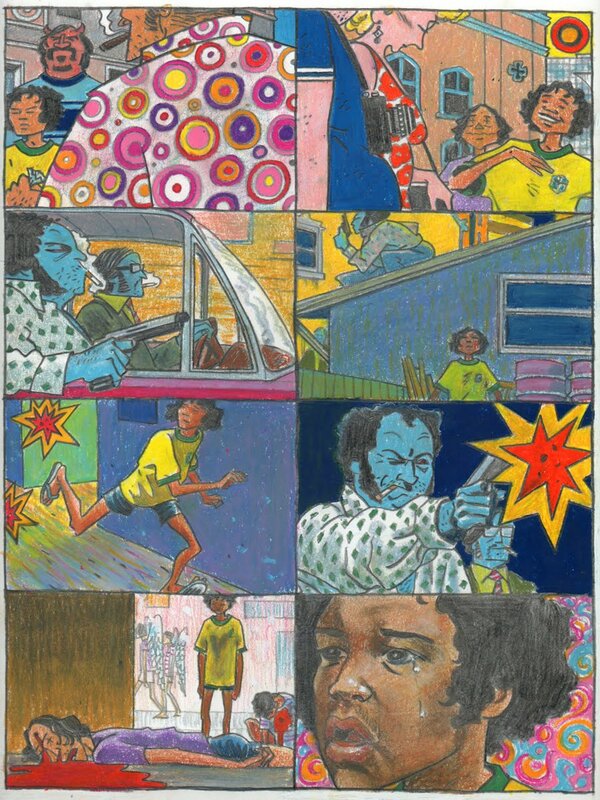 It has a kind of World Cup theme as it's about Melchester Rovers signing Brazilian World Cup star, Malandro. Again in typical Monthly style we used the arrival of the Brazilian to do a flashback to his upbringing in the Favelas (contrasting with his English counterparts). 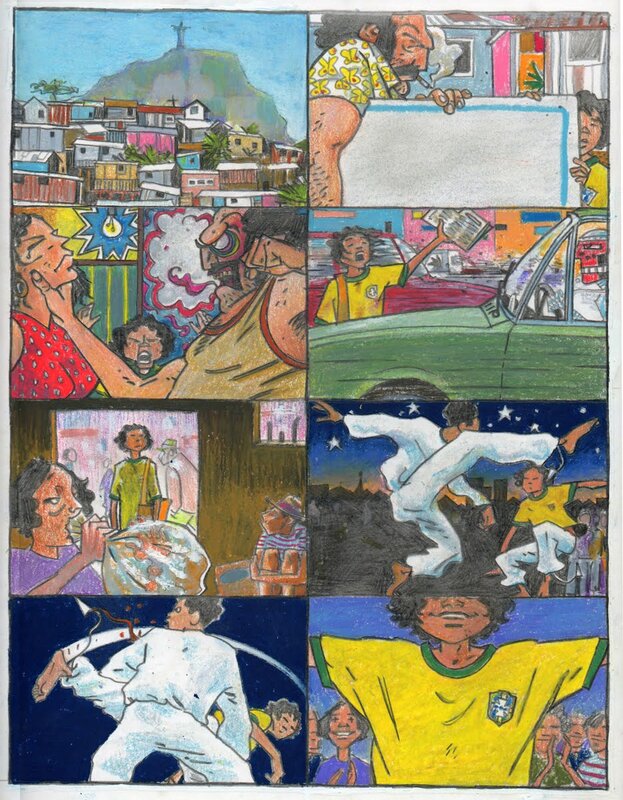 Malandro's story includes wife beating, drug addiction and the Capoeira - the dance of the knives. Things of note here are the shift in art style and the sense of unreality, this entire spread is drawn in pencil and oil pastels and I think I was trying for a kind of magic realism (very South American) because this life is a world away from ours and the events in it (murder and violence as daily occurrence) are impossible for anyone to accept without some kind of schism. Really odd and powerful stuff to be putting out in a comic for kids. Stuart Green (writer/editor) said recently of the ideas in the comic that 'we were ahead of our time', (classic excuse for not selling enough comics). I'm not sure whether that's true or not, but the chances of a comic like this being made for children now is more unlikely than ever.